It had been a late spring, the river was high and the current swift, some geese were nesting in the bushes near by and you could hear an eagle call in the distance. As I contemplated my options for the day, a pool of slack water sparked my interest. With no one in sight at a typically pressured spot, I was excited to test the waters. It was a bright sunny day and I did my best to stay low to the ground, I baited my hook with a chunk of worm and cast out to see what might take it. It wasn't long before something took the bait, my line slowly headed in a different direction and I set the hook, the fight was on. The fish bolted straight into the current and was determined to head down stream, tightening my drag I began reeling in playing the fish as best I could. After a few minutes I managed to get it near shore where it became clear it was a carp, one look at me and it was off to the current again with my drag just screaming. I began to question my ability to net the fish but after a few more runs, it was tired out enough to do so. The fight was phenomenal and I was shaking with adrenaline, this was my first Master Angler carp, not exactly what I was expecting and I knew there had to be more in there. As the sun passed along over head, I repeated the process many times that day. A lot of fish were landed and a few lost. Unless the carp are really tired before netting, it can be tough to do so on your own. Sizes ranged from 26 - 31 inches with a few larger that broke off or spit the hook while I was trying to net them. I was shocked at how fun the fight was and how well they were releasing after the battle, throw in a few suckers and walleye to give my arms a rest and this was turning out to be a great day. I continued fishing for as long as time permitted and on the way home I added another species to the addiction list. Carp originated in Asia, in China they have been raising them in ponds all the way back to roughly 500 BC. Somewhere along the way, they were brought to Europe as a food source and over the last hundred years have become a prized and sought after trophy fish known for its fight and size. As far as Manitoba goes, carp were first noticeably caught in the 1930's and by the 50's their presence in the south basin of Lake Winnipeg became evident. The common carp kills aquatic vegetation and stirs up detritus on the bottom of water bodies, degrading spawning habitat and contributing to loss of food sources for wildlife and fish. Many attempts at preventing entry to some water bodies have been made all over North America with almost all of them unsuccessful. The Common Carp have proven themselves quite adaptable, they are typically found in muddy bottom areas with vegetation and slower current. They can also be found in shallow bays, bottoms of dams and sadly, marshes (where they do their most destruction). They are some of the first fish to show up in the warm shallows in spring and summer to spawn, becoming visible to the keen anglers eye. When targeting large carp it's good to keep in mind they are smart, keeping quite and avoiding unnecessary noises will be in your best interests, along with keeping your shadow off the water and low to the ground. When they rummage around the bottom feeding they will spit out anything that doesn't feel natural, often the fist sign of a bite is your line moving in a different direction in the water, close the bail, set the hook and hang on! A medium heavy to heavy spinning or bait caster rod works well for carp, 14 to 30 lb line is best (some like heavier) with at least 150 yards on the reel. Hook size and weight depends on current, the size of the targeted carp and the situation you are fishing. Free slider sinker rigs, hair rigs and slip bobber rigs all work well, different days call for different set ups. Simple baits are: worms, corn, marshmallows and white bread, another option is home made dough baits (made from flour, cornmeal boiled water and molasses) Remember, the more of the hook that gets covered by the bait the more likely the fish will take it. Chumming the water with your chosen bait is a good plan as well, it can stimulate the feeding and get the fish a little more active. I have since pursued carp at a few different locations purely for the fight, some days more successful than others. When the time is right you gotta have at 'er. I can see why serious carp anglers from around the world pay big bucks to hit certain rivers in Canada to have a chance at fighting these monsters. 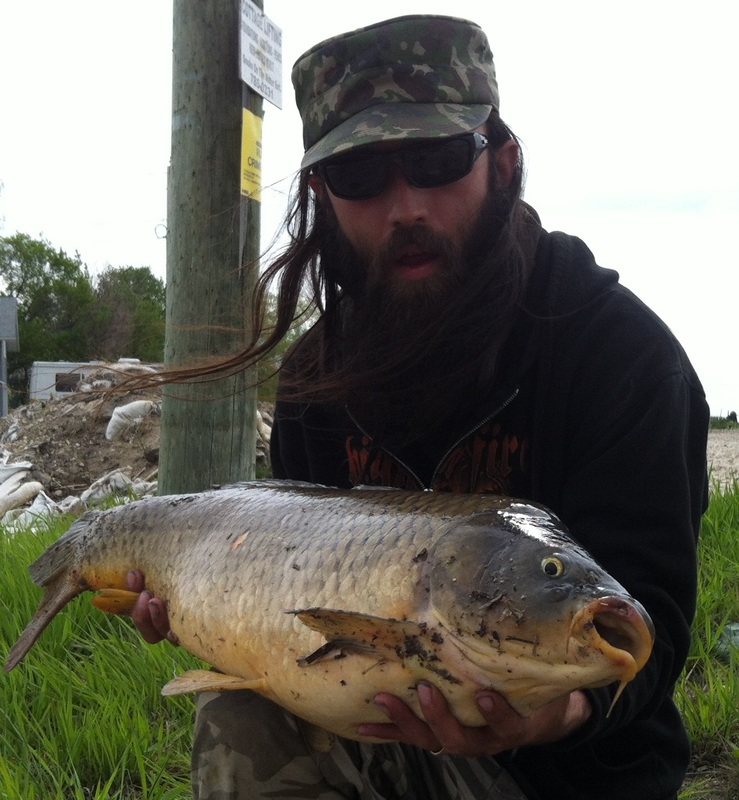 It's doubtful we will ever eradicate carp in Manitoba, however projects are in the works whether they be fish grates preventing the carp from entering key areas, commercial harvest and export or even a fertilizer plant in the works. With so many hard fighting freshwater species in our province you are missing out if you haven't battled with a big carp at one point or another. So if you are after a good fight and something different from your usual targeted species, try carp on the line, I have a feeling you won't regret it.